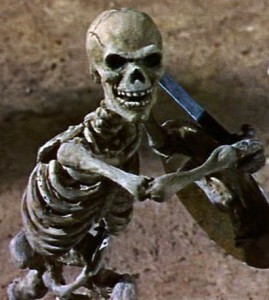 Fighting skelton from Ray Harryhausen’s, Jason and the Argonauts. But it doesn’t work…it never works. The game will continue until he gets bored and we decide to flip through our old comics again, see what late-night movie is on TV, or settle down to work on our own drawings. It is a game where I am terrified, not that I’d die, because that wasn’t his goal, but that one of us would end up genuinely hurt. That danger is part of the game. It’s an adrenaline rush that David will be seeking for the next 25 years. Long before then I had realized that the worst thing I could do was panic. 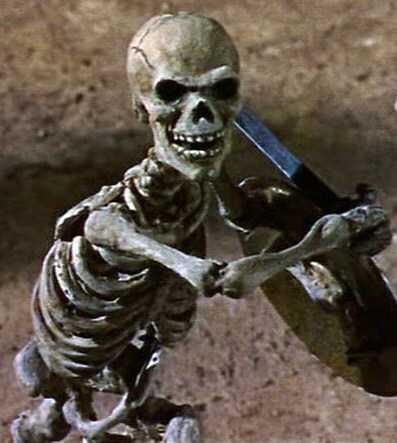 David would feed off of any fear; increasing his intensity as his tall, skeletal frame chased me through his house. Spending the night at a friend’s house was always fraught with both tension and adventure, but none of my other friends pretended to be a psycho; chasing me through their homes while their parents peacefully slumbered away. Later in my life, I’d hear stories of similar games between brothers and sisters. Stories where kids would end up hurt, sometimes being rushed to the hospital, but nothing ever fatal aside from scars. My sister and I didn’t play such games. We were raised in a climate where we understood that the possible repercussions weren’t worth the risk. These reservations both helped and hindered me later in life. My mom attempted to ingrain a respect for limitations by warning us about the perils of strangers, unrestricted horseplay, venturing out of the neighborhood, promiscuity, and untamed wildlife. These lessons were often accompanied by stories where the inevitable result was death or permanent disability. I’d lay awake at night, tempted like most kids to break the rules, but also terrified that I might end up as another example on the list.